Ubuntu on the XO laptop! 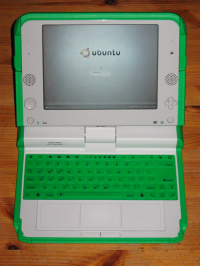 Kernel is from OLPC release 8.2.0. USB boot fix in ramdisk is the only change that was applied to OLPC-distributed files. Ubuntu packages are properly identified as manually/automatically installed for easier customization, patched files are diverted, so package manager won't replace them on upgrades. Network Manager 0.7 is in Intrepid -- there is no need for custom repositories. clive package in Intrepid is also up to the latest version, so tubewatcher script is included without clive replacement. Firefox default configuration is adapted to screen resolution (larger fonts but no scaling for images), and libraries that come with xulrunner are replaced with ones that come with Firefox 3.0.4 release (for some reason libraries from xulrunner package occasionally replace images with noise). syslog is removed -- logging to SD or USB takes large amount of resources. GTK theme is adapted to the changes in theme engines that come with Ubuntu -- it looks slightly better now, though differences are minimal. Splash screen is shown on boot and shutdown. I will not pretend to understand all those modifications or install steps that Teapot talks about in the OLPC News Forum entry. I will only tease you with the idea of a Live SD Card available soon for those like me who want an easy and Open Source dual boot XO. You've heard the talk about the XO-1.5 laptop having a dual boot of Gnome and Sugar user interfaces on the Fedora 11 core. You've been thinking how this dual boot system might work, and how easy it would be to jump back and forth between the two. Any chance to get this into the Ubuntu repositories? I installed this earlier this week, haven't got to play with it but my roommate who had been using Build767/8.2 Sugar+Browse reports that browsing under Firefox seems much faster. I'm confused about the "Live SD Card" comment by Wayan, since This version of Ubuntu installs and runs from a 2GB SD card, leaving Sugar on the XO's flash drive, so it sounds like a Live SD card to me. Is it just a reference to a possible pre-imaged SD card, so that the end user doesn't have to install the Live image on the card? Teapot and I are developing a Ubuntu SD Card similar to the Fedora 10 SD card for those that do not want to go through the hassle of imaging their own SD card. I for one, am way too busy/lazy to create my own SD card. I'd love to have one made already and am willing to pay for it. I don't think I am alone. Especially for Ubuntu. This is pretty impressive; I'll probably see if I can adapt the instructions to run from a USB stick (I strangely like Sugar as my default OS - at least for now - and don't want to be popping out the SD card all the time). That being said, pre-imaged SD cards (and USB sticks) with Ubuntu on them would be handy! "I strangely like Sugar as my default OS - at least for now - and don't want to be popping out the SD card all the time"
No need to. Press hold the "O" or the "X" game key before turning on the power. Then release the key when prompted to on the screen. The machine will boot into Sugar. The X key also makes the machine boot like a normal XO without a developer's key. The game keys are directly above the power button on the screen portion of the laptop. You can also do this during a reboot from Ubuntu. There is no need to put these into the Ubuntu repos. This practically works from the Ubuntu repos and anything Ubuntu can be installed on it. Only the kernel is taken from Sugar and there are packaged customizations which are also compatible with the repos. Not everything is in repositories -- power management support, power monitoring script, keyboard and screen features support, mplayer options, GUI/icon theme are XO-specific. It will make sense to submit them as packages to Ubuntu, and make a make a metapackage that depends on them and the set of Ubuntu packages used in this configuration, so it will be easier to maintain and use in future development. New versions of kernel for XO will be in packages, too. There is no need to wait for an SD version. The install instructions are fairly short and simple. Most of the commands can be simply copied to the command line. So, I think even Linux newbies can do it. From this you can learn a bit more about it before you start installing it. "I will only tease you with the idea of a Live SD Card available soon for those like me who want an easy and Open Source dual boot XO." This is what I would need and would greatly welcome. Please let us know what to expect on the follow-through on your comment. My profuse thanks and congratulations to Teapot. I participated in the first (2007) G1G1 program on the assumption that I would be able to load and use a non-Sugar, GUI Linux distribution. The fact that it took the better part of a year for viable approaches to emerge was frustrating. So this is a big breakthrough. I am not well versed in Linux, but have managed to get my way through moocapiean's method of installing a compressed version of Ubuntu onto a flash drive/SD card, the more recently published instructions on installing Fedora 10 on a SD card and now Teapot's method. While it's probably fair to say that I cut my teeth (wrists?) on the two earlier approaches, I also think it's fair to say that Teapot's method is easiest and gives the best results. Unlike a lot Linux howtos, Teapot's line by line instructions are completely clear. The whole process took less than 1 hr., and that includes the fairly long file copying and unpacking times. The instructions could benefit from some editing for clarity and some really basic information could be added to the first paragraph, such as: You need (a) a 2 GB or larger SD card, (b) a 512 MB or larger USB flash drive, and (c) an updated XO computer. But on the whole, they are very clear. Just follow the steps as shown, and you'll have a card. From my experience, to the extent that average users encounter complications in creating a Ubuntu-loaded SD card, it's more likely going to relate to updating the XO firmware and software and obtaining a security key. In this regard, I think that the 2007 G1G1 program was a bit premature, as the upgrade process to current firmware and software from the earlier generation of XOs was a real pain for a beginner. I can see the trauma of that experience negatively affecting lots of would-be users. However, once that hurdle is cleared, the rest is not so hard. Thanks again, Teapot, for your hard work. This is a big help for me. I've added the installation instructions to the wiki, along with a number of tweaks, tips and fixes gleaned from Teapot's forum thread. As the thread has now grown to more than 40 pages, it's too much to expect a newbie to digest before starting their installation.